The train set is equipped with an emergency brake loop wire. The emergency brake loop is connected to the emergency brake magnet valve, which is opened when de-energized and closed when energized (Fail-safe system). So, in case the emergency brake magnet valve is de-energized by interrupting emergency brake loop, the emergency brake will be applied automatically. The holding brake is provided to prevent the train from rolling backwards on a rising gradient and the train from moving at the station. The holding brake is released when C/I sends the signal “Reset Holding Brake” to the BECU. The tractive effort, which is applied when the signal “Reset Holding Brake Request” is initiated, shall ensure that the train will not roll backwards at a slope. The holding brakes are 70% of full service brakes. Parking brake is used for parking the train in depot and these are installed at Driving trailer car and Motor cars (1 set per axle). Parking brake can be applied manually or these may apply automatically also when the MR pressure is low. To apply parking brake put Mode Selector at Standby position and press “Parking Brake On Push Button”. To release press “Parking Brake OFF Push Button”. Parking brakes are automatically applied in the event of loss of the main reservoir pipe pressure. Parking Brake Manual Release - When MR pressure is low, it is possible to release individual parking brake manually from track level by; pulling out the manual release device installed at the parking brake cylinder. Operation of parking brake is monitored through the parking brake lamp installed at driver’s desk and TIMS screen. When the parking brake is applied the parking brake lamp will be illuminated and the application can be read through TIMS screen also. The load dependent pressure limiting valve (B3.C) is used to limit the supply reservoir air pressure according to the actual car load. At the same time the average load signal is electrically fed to the BECU from the T pressure transducer on the EP-BCU. 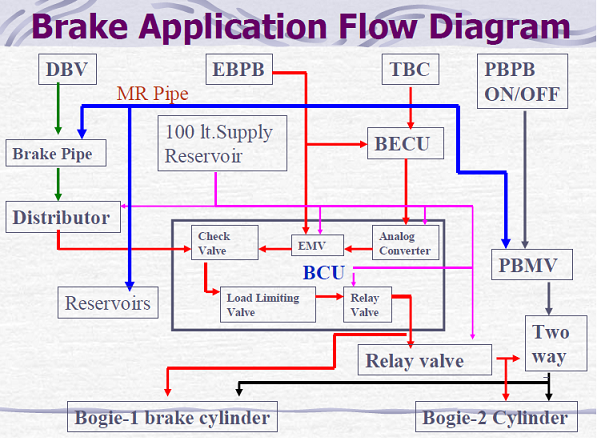 This signal is used for load compensation of the propulsion and air-conditioning system. Wheel slide protection is used to optimize the stopping distance and to avoid the wheel flats under wheel sliding conditions. Wheel slide protection is active in service brake and emergency brake. The wheel slide protection acts per bogie on each car by the dump valves (G2). Wheel-slide protection is operational at all speeds down to 3 km/h. Speed sensor mounted on the cover of each axle box, detects the speed of the associated wheel. When a potential wheel-slide event is detected, the BECU will release/apply the brakes through energizing/ de-energizing the magnets of the dump valves. Wheel slip/slide is also controlled by CI during electric regenerative braking and powering. The compressor is a cylinder piston compressor powered by a 415 V AC, 50Hz motor and it has a capacity of approximately 900 L/min free air at 10 bar. The main air-compressor unit is controlled by one relay contact of BECU in the software to 8.0 bar for cut in and 10 bar for cut out. The second pressure switch (A9) – set to 7.5 bar for cut in and 10 bar for cut out is provided as hardwired back-up in case of failure of BECU. Based on the electrical signals of the pressure switch A9 and pressure transducer A10 the main motor contactor is controlled. In normal service operation the air compressors of each DT car is controlled individually by the relevant BECU at that trailer car. The BECU in turn communicates with all other BECU installed in the train consist to determine which air compressor should be operated. Moisture in compressed air systems often causes the pneumatic equipment to malfunction and wear prematurely as a result of corrosion and freezing. The compressed air supplied by the main air compressor is filtered by oil separator and dried by the air dryer unit and filtered by the oil micro filter. The air dryer unit consists of two chambers with a adsorptive desiccant. While the main air flow is being dried in one chamber (I), the desiccant of the other chamber (I) is being regenerated by the reversed air flow.